Cable television officially peaked in the year 2000. As the dot-com bubble got ready to burst, more than 68 million American households subscribed to cable TV, a number that has declined by millions each year. That number now stands at around 49 million and will likely continue to fall as people grow less interested in paying hundreds of dollars a month for hundreds of TV channels they don’t watch. The paradigm might finally be shifting to something you could cheekily call “skinny TV”—a world where you pay far less for a far smaller bundle of channels. YouTube is taking a step in that direction with its new service “YouTube TV,” which will reportedly cost $35 a month and allow you to stream all of the major networks and plenty more cable channels through an online app. It’s the latest in a series of ventures rolling out in 2017 that are trying to make a serious challenge to a long-established norm, gambling that viewers really only pay their cable bill to get access to the big networks, some cable news, and sports channels like ESPN. The Dish Network, Sony, and AT&T have all released such models, with another by Hulu on the way, and whether or not any of them stick, they could mark the beginning of the end for an increasingly unpopular payment model. The amount of subscribers bleeding from traditional cable television (so-called “cord-cutters,” happy to rely on their Netflix, Hulu, and HBO Go subscriptions) has, in the eyes of YouTube (which is owned by Google) and others, left a window open for a third way. YouTube TV has cut deals with the conglomerates behind big networks, while avoiding the companies that run basic-cable channels. So Disney (which owns ABC, ESPN, The Disney Channel, and Freeform) is on board, as is Comcast (NBC, USA, Syfy, Bravo, Telemundo, E!, and others) and Fox (including FX, Fox News, and National Geographic). Notably missing are cable brands like Turner (TBS, TMC, TNT, CNN), Cablevision (AMC, IFC, BBC America), and Viacom (MTV, BET, Nickelodeon, Spike TV). The full list of channels can be seen here; it’s an attractive enough package for $35, but certainly not one that will cover every viewer’s bases. YouTube is certainly taking a risk with this approach. The allure of cable television has always been in the breadth of its offerings—by bundling so many hundreds of channels together, even if some of them are completely insignificant, it can offer something for everybody. But as cable costs have ballooned and streaming networks like Netflix have moved into original television content, there’s less reason to shell out for a giant TV package if an online one offers most of what you want. More importantly, if a model like YouTube TV can really break through, it’ll create a new baseline for what people expect to pay for live television. The average cable TV bill right now is more than $100 a month; at some point, some critical mass of users will realize they can get everything they want (and for many cable subscribers, ESPN is the chief thing that they want) for far less and begin to switch off in droves. It’s a dramatic outcome cable TV has largely avoided until now—instead it’s been watching as subscribers slowly fall away year after year—but it’s an unavoidable demographic issue. Younger people have less attachment to cable television, and little incentive to start developing one. 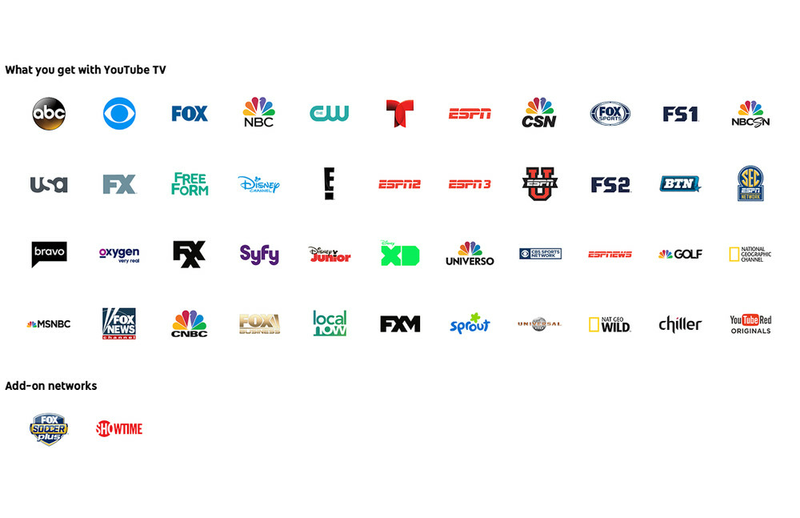 The future is not going to be YouTube TV alone, but some larger hodgepodge of options. YouTube TV will only be available as a Chromecast app to begin with, so Apple and Amazon users may end up gravitating toward different packages like Sling TV, or some future plan on the horizon (rumors that Apple is going to offer a TV streaming service continue to bubble up). Each will offer some competitive package of channels that gets supplemented with premium services like Netflix or HBO. In short, the one-size-fits-all cable macro-culture cannot survive forever. The question is simply which service will be the first to take it down.